New Jumi 2.1 is going to be released on April 7th. It will be available for downloads from standard place. Jooma! 1.5.8 have introduced so called black/white list. Jumi 2.1 uses this feature and Jumi plugin will not be shown if article author is on the blacklist or is not on whitelist. This syntax enables (with accompanying new editor-xtd plugin Jumicoder) to write codes directly into Joomla!. So now you have got three possibilities how to include the code via Jumi plugin: from a Jumi component database table, from a file or directly. In Joomla! pdf representation of the articles Jumi code is rendered now. From RSS feeds it is totally sripped out (not visible). Jumi plugin code can also be included into section and category descriptions now. Jumi module and plugin have got so called "debug mode". If debug mode is to Off then No Jumi internal error messages will be shown in the frontend. You will see nothing instead (in place of custom code). Good for your visitors! There are another minor changes and improvements there coming mainly from your, Jumi users, wishes. We are not sure how Joomla! community will welcome all these - as we think positive - changes. 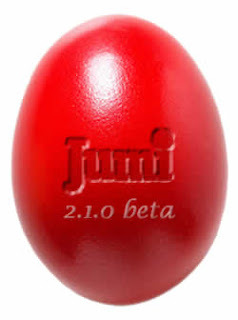 So we decided to release Jumi 2.1 as a beta from the very beginning. But be sure we have tested it for several month and we are almost sure you will not encounter any security problem or a big bug there. Should you encounter any will you be so kind and report it to us? For example in Jumi thread at Joomla! forum. Thank you in an advance. And, by the way, happy EASTER to all of you!! !